"Obey or you shall be exterminated!" The guards taking the Doctor, Quinn and Polly to the prison are stopped by Daleks allowing the escape of their prisoners. Janley is pleased the rebels appear to have won but Bragen wants to wipe them out too. Valmar overhears this conversation, and releases Ben reuniting him with the others in the guest quarters. Bragen announces he has taken over. 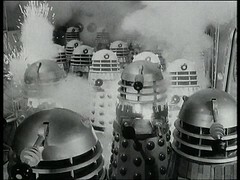 The Doctor slips away as the Daleks give the order to exterminate. He is nearly captured by Kebble and two guards, but the guards are exterminated and the Doctor saves Kebble's life as they escape together. However Kebble is gunned down as they reach the visitors quarters and the Doctor & his party are forced to flee through the window. 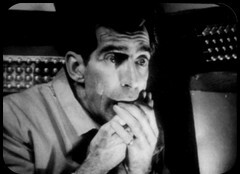 The Doctor and his friends find their way to the lab where the now deranged Lesterson is hiding. Janley is killed by a Dalek but Valmar is saved by Quinn. 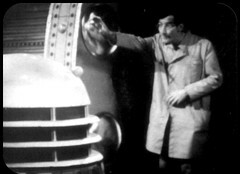 Lesterson tells the Doctor about the Daleks second power supply and the Doctor finds Valmar to get him to reveal the location of the cable. Quinn finds his way to the governor's office where Bragen is desperately trying to summon guards to divert the attentions of the Daleks. 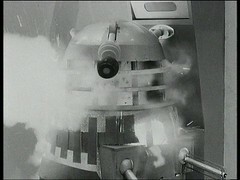 Lesterson sacrifices himself to allow the Doctor to sabotage the Dalek's power supply which he overloads destroying the Daleks throughout the colony and their ship. Bragen is killed by Valmar who joins with Quinn to rebuild the colony and it's wrecked power supply. The Doctor and his friends slip away, passing a wrecked Dalek beside the Tardis which moves it's eye stalk as the ship dematerialises. 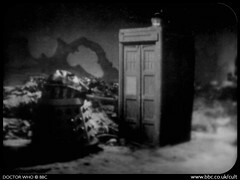 A little bit of a hint there at the end that just maybe the Daleks might return to menace the colonists again perhaps? If episodes still had titles then this would be "The Dalek Massacre of Vulcan". 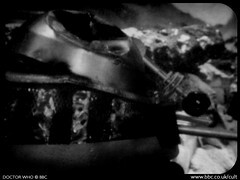 We've seen two big Dalek massacres before now: The Thals in the Dalek city halfway through the Daleks and the attacking rebels at the Spaceport in Dalek Invasion of Earth, but this takes the biscuit with bodies dropping all over the place. The Time Team used to have a count of On Screen Deaths. With just the telesnaps to go on it's hard to keep an accurate account, but I suspect it may have been difficult even with the full pictures! In many ways this story is a gold standard for Dalek and Base under Siege. Take a few Daleks and within days they've killed nearly everyone! For me the extent of the massacre was brought home by a couple of the surviving colour photos from this story, which can be seen in an archived section of the BBC site. 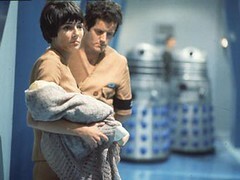 A couple, wife holding a babe in arms, are menaced by the Daleks. I'd never seen the next photo before which shows smoke coming out of the Daleks which indicates this shot must have occurred at the point where the Daleks start to explode. A clip of the destruction of the Daleks and their production line survives courtesy of a program called Tom Tom from 1968 which has always resided in the BBC archives and is included on the Doctor Who - Lost In Time DVD. In a way this episode involves many of the characters getting what's coming to them. Bragen, Janley and Kebble are all killed, the last two by the Daleks. The only surviving named rebel is Valmar, and he'd been the sympathetic rebel character in previous episodes. LESTERSON: You must be absolutely quiet. They know everything that's going on. Everything! They even know what you're thinking. BEN: Where do they get their power from, Lesterson? LESTERSON: Ah, I tried to turn the power off, but they were miles ahead of me. Marvellous creatures. You have to admire them. BEN: But we've got to stop them! LESTERSON: Oh, it's too late for that. They're the new species, you see, taking over from homo sapiens. Man's had his day. Finished now. POLLY: Can't we do anything?! They're murdering everybody, one by one! BEN: You've done all this. Why'd you give them power in the first place? LESTERSON: Well, I could control it, you see. And then Janley got one of her men, Valmar, I think it was, yes, and he rigged up a secret cable. It's carrying power directly from the colony's supply. DOCTOR: Where? Where is it, Lesterson? LESTERSON: Valmar's the only one who can answer that. Or the Daleks of course. They know everything. Yes, you should ask the Daleks. DALEK: Our cables have been moved. LESTERSON: And I could tell you who did it. DALEK: What were you doing in there? LESTERSON: I want to help you. LESTERSON: I am your servant. DALEK: We do not need humans now. LESTERSON: Ah, but you wouldn't kill me. I gave you life. DALEK: Yes, you gave us life. His repeat of the oft used Dalek phrase from this story "I am your servant" is chilling, confirming that in his mind he feels man has had his day and the Daleks have taken over and are superior. Yet is this last piece of madness really insanity or a final act of heroism, distracting and occupying the Daleks while providing the Doctor with the opportunity to destroy the Daleks power supply? So Power of the Daleks: top start for the new Doctor. It's a great story that builds and builds, not like some six parters which are a four parter and two parter stuck together. Five weeks of plotting and manipulating ends in one of the best Dalek action episodes. It's just such a shame that it doesn't exist. If you asked any Doctor Who fan it's probably be in their top 3 of stories they'd like returned. It's the First Second Doctor Story and his first meeting with the Daleks so on that count alone it's historically significant. It's also unique amongst the Troughton stories in that there's something, or rather someone, missing. That'll be fixed in the next story, The Highlanders. If you asked me, it'd be second on my list, behind The Abominable Snowmen. Power of the Daleks was the penultimate TV story novelised. Written by John Peel, one of the earliest fans to go professional, it appears without the Target logo and with a different cover and spine design to the other Target books and reprints. The Power of the Daleks soundtrack was one of the first released on tape in 1993, with narration by Tom Baker, alongside Evil of the Daleks. These tapes were a big hit but the range proved rather short lived with just five titles. Power of the Daleks was then released on CD in 2003 as part of the revived missing stories range with narration by Anneke Wills. Initially this was only available in a tinned two pack with Evil of the Daleks, but had a stand along release in 2004. The Power of the Daleks CD release was used as the basis for an MP3 CD release in 2005, Doctor Who Reconstructed: The Power of the Daleks, which paired the soundtrack on mp3 with the telesnaps in a flash animation to provide a reconstruction of the story. Unfortunately MP3 CDs didn't take off and subsequent releases were shelved. Today the Reconstructed CD fetches a penny or two (£50 on Amazon Marketplace at the time of writing). I bought one off of eBay for £30 at the point I started writing the first edition of this Blog so watching these six episodes then was the first time I've experienced the story paired with the pictures. I'm presuming Power was chosen due to being a story where no episodes exist *and* where a complete set of Telesnaps exist. The other candidates using this criteria are The Savages, The Smugglers, The Highlanders, The Macra Terror and the Fury from the Deep. Given that Power has Daleks and is the first Troughton story it's a bit of a no contest. The only *slightly* annoying thing about them is the episodes being broken in two unequal halves. As they stand the episodes have a natural break in the middle with a fade to black to allow foreign broadcasters to have an ad break - why not break the episodes there? The chances of recovery for this story are very slim as a maximum of two film prints are known to exist. 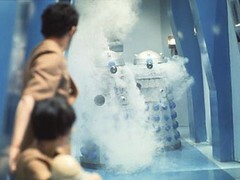 The first was sold to the ABC in Australia, who returned them to the BBC in 1975 where they were presumably destroyed. However almost every missing episode that's been found in private hands in the UK is known to have come from this set of returns so there's a possibility prints of this story may have walked out the door at the time. The second print was sold to the NZBC in New Zealand who passed their prints to RTS in Singapore who confirm that they no longer have them. Given the lack of eisting Power of the Daleks episodes, plus that the BBC has run out of episodes to release on DVD, and that telesnap recons have made a welcome (to me at least!) comeback recently on The Web of Fear and Underwater Menace DVD I wonder if any thought has been given to using this recon, perhaps paired with an un-narated soundtrack and with existing clips dropped in, as the basis for a Power of the Daleks DVD release? BBC Worldwide, I have money for you! It seems someone was listening! In 2016 Power of the Daleks was unexpectedly announced as an an animated reconstruction for download and shortly afterwards a DVD release. Since the DVD also contains the existing MP3 CD release plus the existing clips from The Lost in Time DVD, plus I think a few extra which have come to light since, I'm happy with it. Ideally I'd have the clips dropped into the recon and with the option to have the recon with the original un-narrated soundtrack. The addition of a making of documentary & photo galleries are an extra bonus, so effectively these are better releases than Enemy of the World or Web of Fear, both of which were rush released with no special features. The main draw here for most people will be the animation which is on the whole very very good. Yes there's a few errors, notably Ben & Polly's costumes changing in one scene in episode one, and a couple of rather stiff exterminations this episodes but The Daleks look magnificent throughout! A Blu Ray version, containing a colour version of the animation, is due in January 2017.